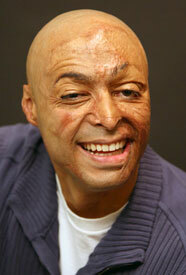 J.R. Martinez, an actor on the ABC soap opera All My Children and an Operation Iraqi Freedom veteran who gives motivational speeches across the country, will be on the campus of the United States Sports Academy on 21 January 2010 to receive a courage award. Martinez will receive the Academy’s Mildred “Babe” Didrikson-Zaharias Courage Award during a presentation at 5 p.m. Thursday, 21 January 2010 in conjunction with an art show honoring the American Sport Art Museum & Archives Sport Artist of the Year, TAFA. The public is welcome to attend the art show by calling the Academy with a reservation at (251) 626-3303 or by emailing communications@ussa.edu. Martinez grew up playing high school football in Hope, Ark., before moving to Dalton, Ga., where he was a special teams standout and backup running back for a high school team that finished as state runners-up. After high school he enlisted in the Army. One year later, while stationed in Karbala, Iraq, the Humvee he was driving was struck by a land-mine. The injuries he sustained left him severely burned over 40 percent of his body, including the entire left side of his face. After 32 surgeries, the longest lasting 15 hours, over 34 months, Martinez decided to use his scars to “get people’s attention” and have his positive message of life and faith heard. Martinez plays the character Brot on “All My Children.” He is a veteran who is re-establishing his life in the civilian world. His storyline finds him falling in love with a beautiful character, but because of his disfigurement, he is unsure if his romantic attention will be accepted. The Courage Award is presented annually as part of the Academy’s Awards of Sport program, honoring the artist and the athlete. It is presented to an individual who demonstrates courageous action in overcoming adversity and exhibits grace and perseverance in doing so.